We sat down on Thursday night & worked out a list of what is going where. Maybe I should scan it & call it a photo of the day. However I have taken a photo of the blue room as it is currently. Very shortly Scott & I will be sleeping in here on our bed from our bedroom, we haven't slept in that bed since the fire. We took a load of contents from the wardrobe in the spare bedroom up to mum's for storage. 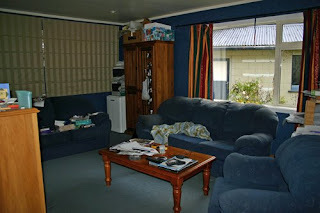 At the time I write this post Scott & the boys are taking the wine from behind the 2 seater couch, in this photo, plus the curtains from our bedroom plus the contents of Scott's side of the wardrobe up to mum's. We are hoping to move the two seater couch into the dining room/living room just so there is no chance of damage at the storage place. On Sunday we are hoping to move Brent's bed into the spare room, the bed that is there currently will briefly stay in our bedroom while the bed from our bedroom will be moved into the blue room. The coffee table in the photo will just have to be put in our bedroom to go with the spare bed to the storage facility on Tuesday.